We examined potential nonlinear links between age and subjective well-being, and the interpersonal processes (i.e., support, conflict) responsible for such links. One hundred forty-four men and women between the ages of 30–70 completed measures of satisfaction with life, social support (interpersonal support evaluation list), and social negativity (test of negative social exchanges). Nonlinear regression analyses revealed a significant quadratic trend between age and satisfaction with life (SWL, p = .01) where age was associated with lower SWL in the young to middle-aged sample, but higher SWL in the middle-age to older adult sample. Analyses further revealed that interpersonal tensions statistically mediated the nonlinear links between age and SWL. 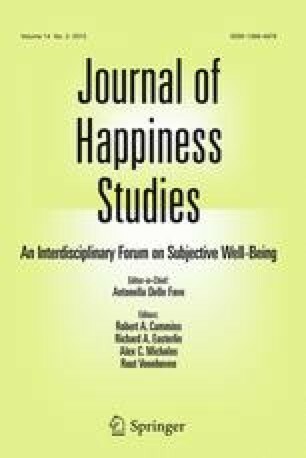 These data suggest that negative interpersonal exchanges may be important contributors to well-being at midlife. This research was generously supported by a James A. Shannon Director’s Award 1 R55 AG13968. Caron, J. (2012). Predictors of quality of life in economically disadvantaged populations in Montreal. Social Indicators Research, 107(3), 411–427. doi: 10.1007/s11205-011-9855-0.